Etsy has an amazing week called “hack week” where we all get the opportunity to work on fun projects instead of our regular jobs. I sat down yesterday as part of Etsy’s hack week and decided “I am finally going to make that package I keep saying I am going to make.” It took me such little time that I was hit with that familiar feeling of the joy of optimization combined with the regret of past inefficiencies (joygret?). I wish I could go back in time and create the package the first moment I thought about it, and then use all the saved time to watch cat videos because that really would have been more productive. The packages you will need to create a package are devtools and roxygen2. I am having you download the development version of the roxygen2 package. You are going to create a directory with the bare minimum folders of R packages. I am going to make a cat-themed package as an illustration. If you look in your parent directory, you will now have a folder called cats, and in it you will have two folders and one file called DESCRIPTION. You should edit the DESCRIPTION file to include all of your contact information, etc. 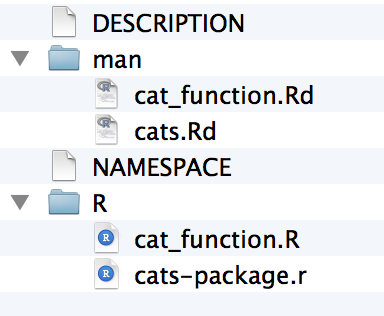 Save this as a cat_function.R to your R directory. This always seemed like the most intimidating step to me. I’m here to tell you — it’s super quick. The package roxygen2 that makes everything amazing and simple. The way it works is that you add special comments to the beginning of each function, that will later be compiled into the correct format for package documentation. 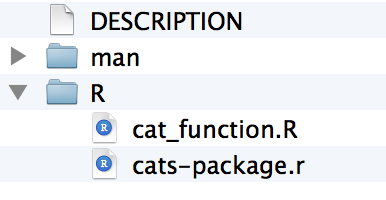 The details can be found in the roxygen2 documentation — I will just provide an example for our cat function. 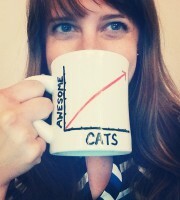 #' This function allows you to express your love of cats. #' @param love Do you love cats? Defaults to TRUE. I’m personally a fan of creating a new file for each function, but if you’d rather you can simply create new functions sequentially in one file — just make sure to add the documentation comments before each function. This automatically adds in the .Rd files to the man directory, and adds a NAMESPACE file to the main directory. You can read up more about these, but in terms of steps you need to take, you really don’t have to do anything further. Now it is as simple as installing the package! You need to run this from the parent working directory that contains the cats folder. Now you have a real, live, functioning R package. 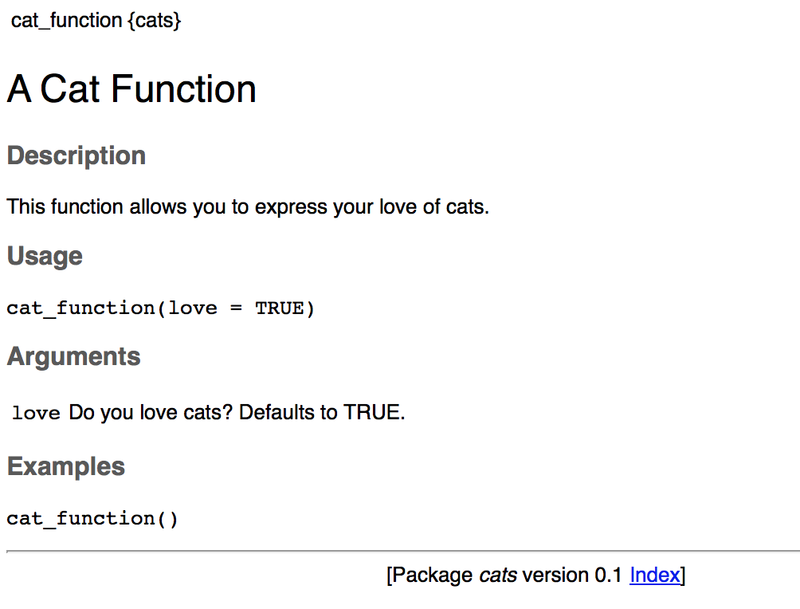 For example, try typing ?cat_function. You should see the standard help page pop up! This isn’t a post about learning to use git and GitHub — for that I recommend Karl Broman’s Git/GitHub Guide. The benefit, however, to putting your package onto GitHub is that you can use the devtools install_github() function to install your new package directly from the GitHub page. This is where the benefit of having the package pulled together really helps. You can flesh out the documentation as you use and share the package. You can add new functions the moment you write them, rather than waiting to see if you’ll reuse them. You can divide up the functions into new packages. The possibilities are endless! Additional pontifications: If I have learned anything from my (amazing and eye-opening) first year at Etsy, it’s that the best products are built in small steps, not by waiting for a perfect final product to be created. This concept is called the minimum viable product — it’s best to get a project started and improve it through iteration. R packages can seem like a big, intimidating feat, and they really shouldn’t be. The minimum viable R package is a package with just one function! Additional side-notes: I learned basically all of these tricks at the rOpenSci hackathon. My academic sister Alyssa wrote a blog post describing how great it was. Hadley Wickham gets full credit for envisioning that R packages should be the easiest way to share code, and making functions/resources that make it so easy to do so. I came across this R package on GitHub, and it made me so excited that I decided to write a post about it. It’s a compilation by Karl Broman of various R functions that he’s found helpful to write throughout the years. For whatever reason, when I think of R packages, I think of big, unified projects with a specified scientific aim. This was a great reminder that R packages exist solely for making it easier to distribute code for any purpose. Distributing tips and tricks is certainly a worthy purpose! Routine is your friend. This could really go for everything in your life. Small decisions contribue to decision fatigue, even if it’s something as simple as where to put a file. By automating as much as possible, you’re allowing yourself to save your finite willpower for real work instead of grunt work. It’s easier to start somewhere and then customize, rather than start from the ground up. After four years in grad school, I have a system that I’ve hacked together for how to organize my analyses, but I would have rather not put the energy into creating the system in the first place. Designing a good system takes up a surprising amount of brain space, whereas modifying one takes much less. And since the author of ProjectTemplate seems to know what he’s doing, I doubt I’ll modify much. Reproducibility should be as easy as possible. The way it works, ProjectTemplate makes it very easy to include (but not re-run) the code that you have for preprocessing the data, or other steps that you might only perform once during an analysis. And since reproducibility is such an important aspect of the scientific process, it should be as easy as possible. Finding things should also be as easy as possible. This is quite similar to reproducibility, but on the individual level. I go back to old analyses all the time to borrow code, which can be extremely frustrating to me since some of my older analyses aren’t well organized (see #2). So it’s nice that you’ll know exactly where you placed something, because you have a uniform system in place. Just as an aside, I get the impression from the computer scientists I’ve talked to that they don’t necessarily learn “how to code” in coursework, either, but are also expected to develop a system on their own. This I don’t understand, and perhaps when schooling catches up to the computer era we’ll see a change. For example, in high school I learned the five-paragraph format for writing essays, even though very few professional essayists use the format in publications. But it’s still a solid foundation for expression, which you can stray from as you become more confident in your abilities and command of the process. I suppose this argument requires that coding be taught in high school, but that’s another thing I’d love to see. One day!